K&N 57i Series Induction Kits are specifically designed for each different vehicle and will free your car from the size restriction that comes with the factory air box. 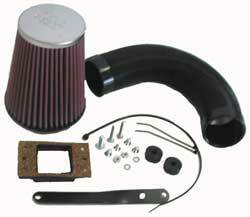 Each kit is designed to provide more power throughout the RPM range by increasing the amount of air your engine uses. As well as increasing power you may also see gains in fuel economy. The extra surface area of these open-air air filters provide even more airflow at lower restriction than a K&N O/E replacement filter which is always limited to the size of the factory air box. The larger air filter also captures and holds more dirt increasing its service life before a cleaning is required (up to 100,000 miles). The filter is either directly attached to the engine carburetor or throttle body or indirectly through a tube assembly running from the filter to the engine. All adaptors are made from high quality materials such as steel, aluminum, silicon or reinforced nylon to ensure long life. More power; by getting an increased airflow to your engine it's allowed to "breath" easier giving it more horsepower. Increased MPG; a rise in the miles per gallon of your car is also a benefit of an intake. Typically 1-2 miles per gallon is added simply with the addition of this intake. More aggressive; adding an aftermarket intake makes your engine bay more appealing and more aggressive. Distinct sound; when you have a stock intake it isn't audible, but the K&N 57i Series maximizes the airflow to your engine which allows you to hear your intake working. Saves money; the intake will last your car a lifetime so no more wasted money on paper filters. Hassle free; with standard OEM paper filters they need changing roughly every 12,000 miles, but with the K&N 57i can go without servicing for up to 100,000 miles. Usually takes less than 90 minutes to complete. Installation only requires normal household tools. Can be completed with only a single person.